England and Tottenham star, Dele Alli scored twice last night to end Chelsea's unbeaten run and to dash the hopes of the Blues in setting a new Premier League record of consecutive wins in the EPL. Chelsea had already managed 13 consecutive victories before the London derby which ended 2-0 in favour of the Spurs. Tottenham looked sharp and ahead of the Blues during play. Dele scored a header in each half to give the White Hart Lane fans all the joy and 3 points. Chelsea trailed a team by 2 goals for the first time in about 3 months. 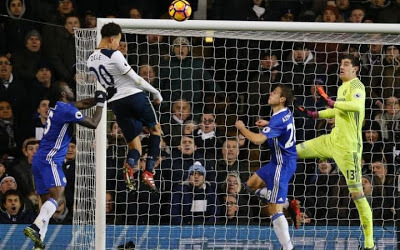 Tottenham were the first team to score before Chelsea in a game during their unbeaten run a fixture which they repeated yesterday at the White Hart Lane. Spurs came ahead through Eriksen during the first leg at the Bridge but the high flying Blues responded back with 2 goals to seal all 3 points. Prior to this match Chelsea had not conceded a goal through an header this season. The home victory to Tottenham put them in 3rd position while the Blues are still 1st with 5 points clear.